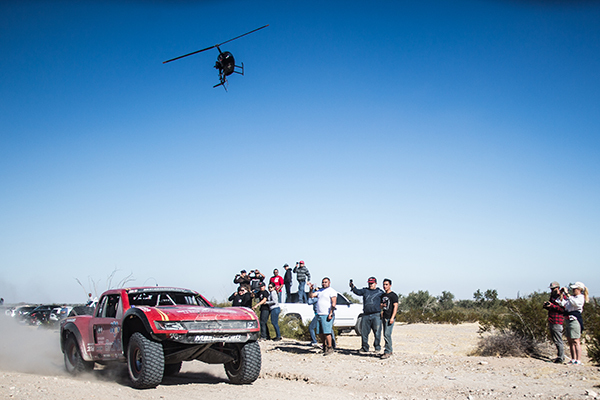 When it comes to shock punishing terrain, few races compare to SCORE International’s San Felipe 250. The San Felipe course contains sand, silt, rocks and miles of bone jarring, square edged whoops. 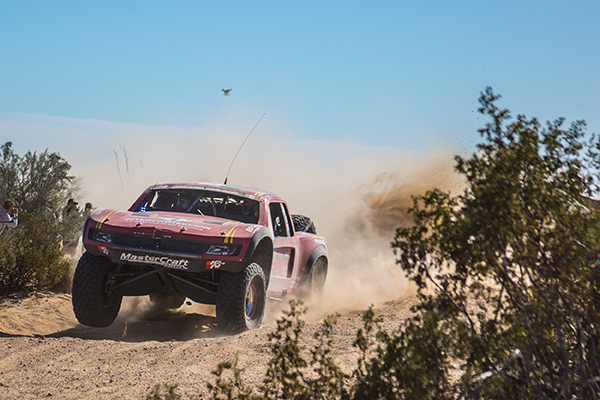 In the unlimited Trophy Truck class, King Shocks racers decimated the competition in San Felipe; taking the overall win and a clean sweep of the podium. This was the second straight year that King Shocks swept the Trophy Truck podium and the third straight San Felipe overall victory for race winner Tavo Vildosola. 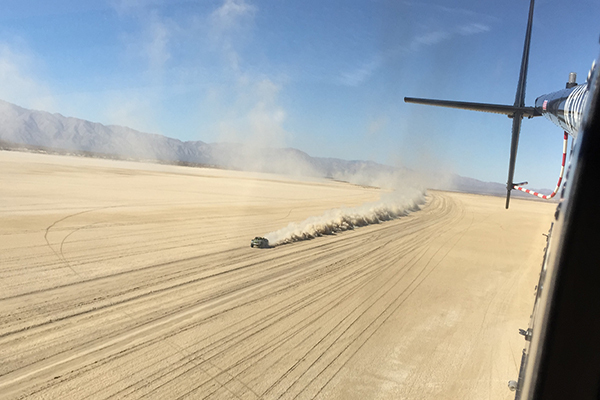 “We had a flawless race, Said Tavo, “We had perfect logistics, a 37 second pit stop and an error free drive to win by three minutes over BJ at nearly a 64 mile per hour average speed. Our old truck could not handle the pace. We were fast but would always break. King Shocks has been a pivotal part of our continued success at San Felipe, we built this new truck on King Shocks and have proven their reliability and performance winning three times consecutively!” BJ Baldwin took second place behind Tavo and third place went to Clyde Stacy; all on King Shocks. Also noteworthy was the fourth place Trophy Truck finish of Justin Davis. Justin charged all the way from the back of the field on King Shocks to miss the podium by only one spot. San Felipe is known for literally cooking shocks; melting seals and boiling shock fluid. King Shocks has tamed the San Felipe terrain with innovative new designs and superior engineering. Larger shock body diameters, finned, heat dissipating reservoirs and specially formulated shock oil blends have allowed King Shocks racers to run flat out; dominating the race. King Shocks also allow precise tunability and the fine adjustments necessary to allow drivers to comfortably run wide open. 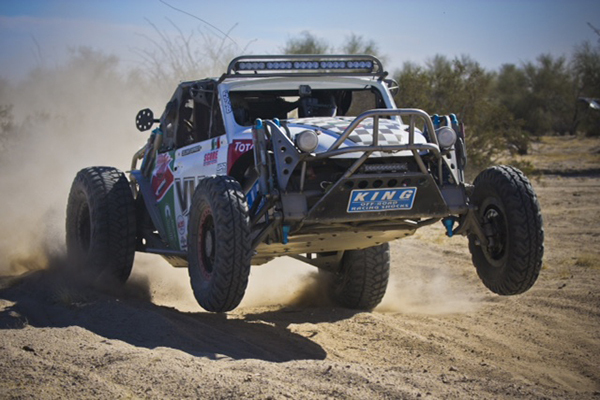 In fact, after tuning multiple competitors, King Shocks tuning specialist Gerardo Iribe competed in the race driving a class 5 unlimited Baja Bug. Iribe took the start and built a sizeable lead before handing the car over to team owner Victor Cesena; co-rider Martin Collins navigated the entire race. Victor battled for miles with another Class 5 car until they fell back due to the pace. At the finish, Iribe, Victor and Martin won class 5 by an hour. The results in San Felipe make it clear. From 850 horsepower unlimited Trophy Trucks to class 5 Baja Bugs King Shocks has the controlled damping performance you need to win in the most challenging conditions.